A well proportioned 4 bedroom detached 'executive' style home in this popular and peaceful development to the South of Tunbridge Wells Town Centre. The property enjoys an especially long dual aspect lounge with a conservatory to the rear, a high specification kitchen/breakfast room and further dining room. 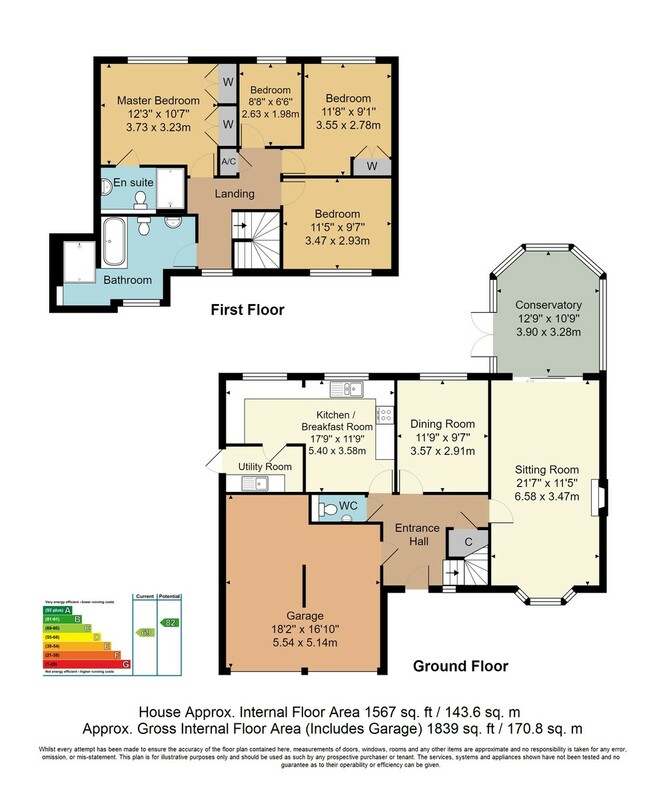 Beyond this it offers an integral double garage, ground floor wc, four bedrooms, a family bathroom and further en-suite facility to the first floor. Externally the property has a drive in front of the aforementioned double garage and a good sized, flat enclosed rear garden. DOUBLE GARAGE: Good space for 2 vehicles and with additional depth in part. Wall mounted Worcester boiler and one remote controlled electric up and over door and one manual door. CONSERVATORY: Wood effect engineered flooring, of a brick and double glazed panel construction with additional ceiling height, double glazed French doors leading to rear garden. DINING ROOM: Wood effect engineered flooring, radiator, double glazed windows to rear, cornicing. UTILITY ROOM: Tiled floor, range of wall and base units with a complimentary work surface, space for freestanding fridge freezer, inset single bowl stainless steel sink with mixer tap over, wall mounted thermostatic control, space for freestanding washing machine, inset spotlights to the ceiling, loft hatch and cornicing. Partially glazed double glazed door to the side with cat flap. DOWNSTAIRS WC: Wood effect engineered flooring, wall mounted sink, part tiled walls, low level wc, heated towel radiator, extractor fan, inset spotlights to ceiling. FIRSTFLOOR LANDING: Carpeted, double glazed windows to the front with fitted roller blind, areas of effect wood panelling, cornicing, loft access hatch, airing cupboard with hot water cylinder and fitted shelves over. FAMILY BATHROOM: Exposed oak flooring, pedestal wash hand basin, feature tiled walls, low level wc, feature roll top style bath with areas of feature tiled panelling, feature mixer tap over with single head shower attachment. Good areas of fitted wall mirrors, inset spots to ceiling, feature cornicing, radiator, opaque double glazed windows to front, heated towel radiator. Walk in shower cubicle with two shower heads, areas of sloping ceiling and inset spotlights to the ceiling. ENSUITE SHOWER ROOM: Oak flooring, walk in shower with sliding glass screens, radiator, areas of effect wood panelling, low level wc, wall mounted sink sitting atop a storage unit with mixer tap over, wall mounted mirror, various fitted wall cupboards, cornicing and inset spotlights to the ceiling. BEDROOM: Laminate flooring, radiator, double glazed windows to rear, cornicing. BEDROOM: Carpeted, radiator, double glazed windows to rear, cornicing, fitted double wardrobe with coat rail and fitted shelves. BEDROOM: Carpeted, radiator, double glazed windows to front, cornicing. OUTSIDE REAR: Low maintenance paved area to the immediate rear of the property extending into the garden with good space for table, chairs and entertaining. External tap. Good sized level family garden set primarily to grass with a further low maintenance patio area to the rear, retaining wooden fencing and good areas of mature shrub and rose borders throughout.